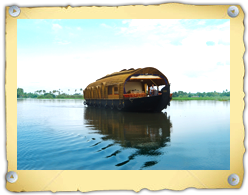 Kerala offers a unique mini - canvas to the traveller; the backwaters, which consist of a complex network of lagoons, lakes & canals. Life on the backwaters is entirely different; water being the key to everything. There are no roads here, only waterways. On the banks one can see lush green rice fields spreading away into the distance and coconut groves with the occasional temple or church. These canals or waterways, vary in dimension from being wide enough to be dubbed lakes, rich with marine bounty. To being nothing but snaking silvers of freshwater. And are mainly concentrated around the townships of allepey, kumarakom, kottayam, quilon and cochin. 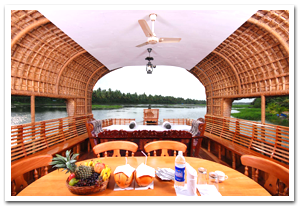 The backwaters are best experienced while slowly punting down the labyrinth of canals in a traditional thatch-roofed houseboat, known as 'kettuvallam'. An experience you will savour for a long time. 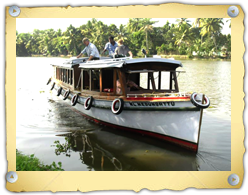 The houseboats are renovated cargo boats… kettuvallam… and are provided with all modern conveniences and comforts to make your stay a pleasant experience. To complement the traditional way of rowing using large poles, outboard engines are also provided. The boats are designed to facilitate a most eco-friendly functioning.